Cervical facet syndrome is a common complaint after whiplash and other injuries such as diving into shallow water or falling off a horse onto the head. This neck pain condition faces the chiropractic physician on a daily basis. Neck pain, headache and, less commonly, pain or tingling radiating down the arm, but more frequently to the region between the shoulders. The cause? Quite simply, trauma, and sometimes poor posture. For example sleeping on your stomach. For years medicine has been in denial that whiplash, and other related trauma, can and frequently does cause injury to the various tissues in the neck. In a 10 year follow up study after whiplash, only 12 percent of the victims reported that they had absolutely no symptoms and had healed completely. In another study reported in Spine, a prominent medical journal, fully 60 percent of whiplash patients were found to be suffering from a Cervical Facet Syndrome. There is oodles of research now on whiplash, done by a whole range of specialists, chiropractic, orthopedic, neurological and radiological confirming the importance of the Cervical Facet Syndrome. 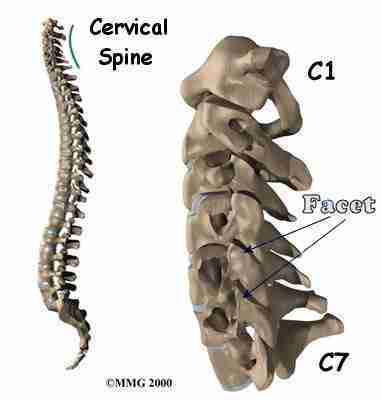 Cervical facet syndrome faces the chiropractor on a daily basis; headache, neck and radiating arm pain are the result. The vertebrae, the ligaments, the muscles, the nerves, the discs and the facets (aka Z-joints) are all vulnerable to whiplash. Other more nebulous tissues too, like the fascia, of course the cord itself, and the blood vessels. Now there is overwhelming evidence that whiplash does cause permanent injury, and the cervical facet syndrome is one of the most traumatised tissues. The atlanto occipital joint is found between the head and the first bone in the neck; cervical facet syndrome can occur there too. These two joints, right and left, lie between the base of the skull known as the occiput, and the first bone in the neck, called the atlas; C0-C1. Hence the name atlanto occipital joint. It is at this point that nodding movements of the skull on the neck occurs; small up and down movements, adjusting the head position in relation to the monitor in front of you, for example. Subluxation of these joints causes a deep ache at the very top of the neck, often causing severe headaches. A large artery supplying the base of the brain winds it's way around this area. Subluxations of this joint can cause widely differing symptoms such as vertigo and loss of balance. Medically this is often causes a condition called benign positional paroxysmal vertigo, and sometimes Meniere's disease, if it there is associated deafness and ringing in the ear. However, in my experience, Meniere's is often wrongly diagnosed, the cause being either at this joint, or that condition in the inner ear, called BPPV that is very treatable with new techniques called the Epley Maneuver; this is a short course for chiropractors wanting to learn the how to do it. This atlanto axial joint anatomy is quite different to C0-C1; we are talking C1-C2. It is here that most of the rotation of the neck occurs. Subluxations of the atlas are one of the causes of a severe stiff neck, often associated with headache too; torticollis physical therapy. This joint has no specific name (as C3 as no name). However, it is possibly the most commonly subluxated joint in the neck. (Chiros will argue vociferously about that!) It too can cause headaches and a very stiff neck called a Torticollis. Pain! 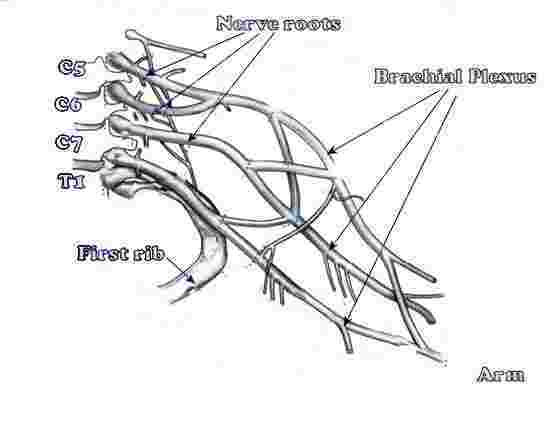 Facets in the mid-to-low cervical spine again are rather different in orientation and also, by virtue of the fact that the nerves emerging from the region supply the shoulder and arm, the Cervical Facet Syndrome presents rather differently. Thus headache is less of a feature in this region. Rather, the fixations cause stiffness of the neck, and associated tightness and pain in the shoulder muscles. Just adjacent to the facets, small joints often injured in MVAs and diving accidents. Known as the Whiplash and the JOINTS of LUSCHKA, they also contribute to radiating pain down the arm; whiplash research makes fascinating reading. Whiplash research is where much cervical facet syndrome is focused. A frank pinched nerve in the lower neck is tested using the Upper Limb Tension Test ... arm pain, repetitive strain injury of the arm, especially at the computer (mouse arm) usually have a neurogenic origin. Because the sensory Trigeminal nucleus of the nerve supplying the jaw joint is found in the upper neck, in the region C1-C3, sensory information from the cervical facets feeding into that same nucleus, the cervical facet syndrome and jaw joint pain often go hand in hand. Between them, the cervical facets and the TMJs are the major cause of blinding Migraine headaches, though it must be recognised there are many causes of migraine. For more about headache in general, and the association between the TMJ and migraine, click here. The whole arm becomes vulnerable. Take note of the first rib in the diagram above. A fixated rib is the most common cause of the so called Thoracic Outlet Syndrome which can affect the artery supplying the arm, and the nerves. Working with your hands above your head, as in hanging the washing, or using a drill above shoulder level, makes your arm tired very quickly. 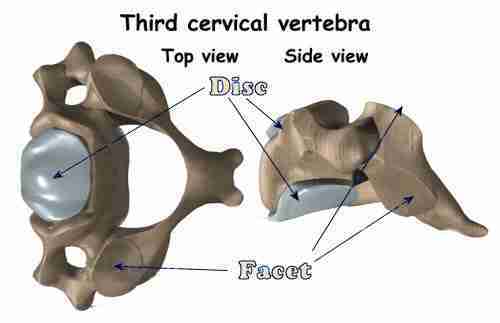 To understand the low cervical facet syndrome properly you need to have some grasp of the low cervical facet anatomy. Deep upper back pain is one of the most trying and difficult conditions in our clinics; I also get a vast number of letters from readers complaining of an unresolved condition. It's simply a complex area, but part of the reason is that it may be caused by a cervical facet syndrome; the rhomboids and levator scapular muscles are supplied by C5. But deep upper back pain can also be caused from a rib, or even lung condition, and many others; it certainly tests a doctor's diagnostic ability, as well as his or her manipulative skills. Which movements provoked the pain? Mostly, though not always, the cervical facet syndrome is bread and butter for chiropractic help. Only rarely are there complications, such as after recent trauma or in very degenerate joints. On any average day, s/he will be treating numerous people with this condition. The treatment will involve soft-tissue work of any associated muscle spasm, perhaps manual traction, and then manipulation. This manipulation is not ordinarily particularly painful, but may be a little unnerving at the first couple Chiropractic help treatments. The Standard Diagnostic Test for this condition. CERVICAL COMPRESSION TEST ... A fun page; don't miss it! There is admittedly nothing simple about chiropractic help treatment of the neck. Like good surgery, it's a mixture of science and art. The art of a gentle yet effective manipulation, that does not cause undue pain or stress on the spine is something that takes years to learn. It is acknowledged that there is some risk associated with all treatment, including Chiropractic. The joints of the spine do not have a direct blood supply. Rather they are dependent for their nutrition on fluids bathing the cartilage. During the night, free from gravity, these fluids are refreshed, infusing the spine. You literally get taller. That's one of the reasons why we are all stiff in the morning, and need to stretch. Take a hint from your cat. Then, during the day, with the weight of gravity, the fluids are squeezed out again, taking noxious waste products with them. This is a very important process for the normal nutrition of the cartilage. Starved of oxygen and nutrients, and the build up of waste products of metabolism, the joint cartilage very quickly begins to degenerate and become arthritic; within 13 hours in white mice. Sleeping on your tum, with your head turned all night, keeps the joints under tension, stopping this nutritional pump from feeding the tissues of the neck adequately. 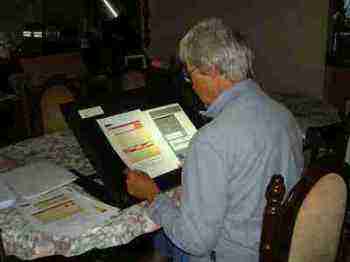 The result is pain and early arthritis of the spine. From an early age, do not put your children to sleep on their tums, as advocated by the famous Dr Spock. There is an increase in cot-deaths, and they will get into a life long habit of sleeping on the stomach that is difficult to break. Prolonged flexion of the neck puts the cervical facets and muscles under arduous strain. Every home and office should have one of these. It will pay for itself in weeks. Increased productivity, less absenteeism due to headache and visits to the doctor and chiropractor. Fewer mistakes from a drugged worker struggling with a headache. The Posturite costs around 100 pounds. 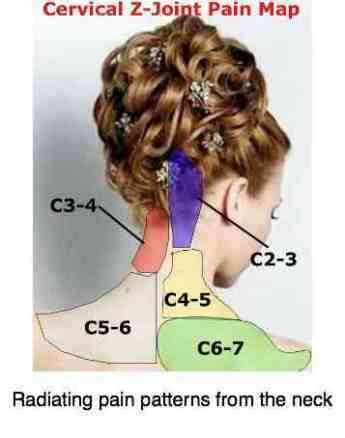 Click on the graphic for details ...wonderful for the Cervical Facet Syndrome. My wife, a teacher, wouldn't be without her Posturite. She uses it EVERY day. Think too about your bedside lights; having to crane your neck to get sufficient direct light is certainly one cause of neck pain. There are few stranger occurrences at the chiropractic coalface than the woman who, coming for cervical facet syndrome care, yet experiencing the inner pain of unexplained infertility, and suddenly becoming pregnant, after years of trying. To my knowledge no trials have ever been attempted, it's just too ludicrous, yet every chiropractor can regale you with anecdotes. The explanation is certainly not obvious; perhaps it just has to do with the release from chronic pain. Straight chiropractors would not be phased in the slightest; subluxations do far more than cause pain; and so they do. Whether due to severe injury, and thus with the best will in the world this was going to happen anyway, or to neglect, the Cervical Facet Syndrome can sometimes lead to such severe degeneration that it can effect the spinal cord, and ultimately cause weakness and disability in the legs. A standard procedure is the Ten Second Step Test. There are few more damaging things for the spine than self manipulation. And I'm not being a humbug, suggesting you pay your chiropractor when you could be treating yourself for free. During a chiropractic manipulation, your doctor will distract the joint so there is no cartilage on cartilage contact during the procedure. Self manipulators can't do that, and trauma occurs every time to you click your own neck; or any joint for that matter. Add to that you cannot do it properly, so you gain very temporary relief. Self manipulators end up popping their own necks half a dozen or more times a day; we think that a joint shouldn't be manipulated more than perhaps twenty five times a year. Self manipulators achieve that in a week; it's severely traumatic for the spine. A severely damaged nerve root and aweful pain radiating down the arm will be the result. Prove me wrong! I've seen it so often. 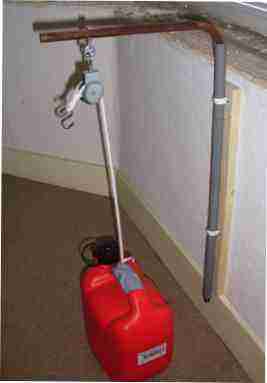 HOME TRACTION UNIT ... make it yourself. Whiplash Chiropractic ... always consult a chiropractor after an accident to prevent Immobilisation Arthritis. A classification system for neck pain ... how bad is your pain?